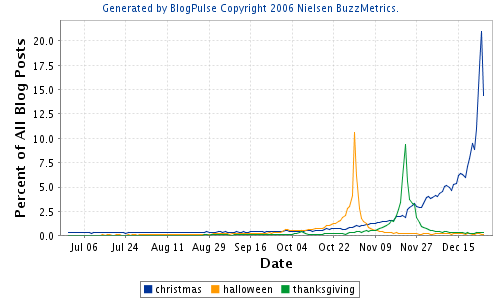 In that year, BlogPulse was named a 'trendsetting product' by KMWorld. One final note: I've always felt that social media analysis, just as it gets comfortable with a particular form of content, gets distracted by a new, shiny channel, abandons the legacy data and starts furiously reinventing its wheels. This certainly happened with the blogosphere when Twitter and Facebook showed up and consumers started to believe that 'real time' was something the blogosphere couldn't provide. From where I'm standing, blogs are alive! If you have any fond memories of BlogPulse, please drop them in the comments to this blog. If you have generated some interesting trend graphs, send me a link and I'll summarize them in an update to this post. 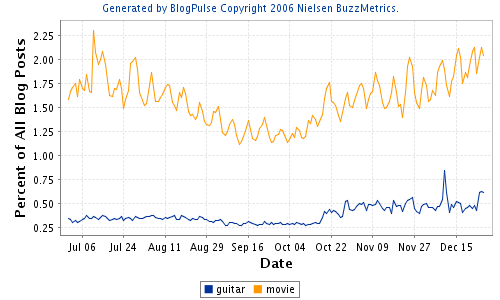 I was playing around with Blogpulse today to look at trends around recent movies and found that 1 week of data (from the 13th of November to the 22nd) is missing. This can be seen in the graph below. The week period with a perfectly straight line indicates that there are no data points between those dates. 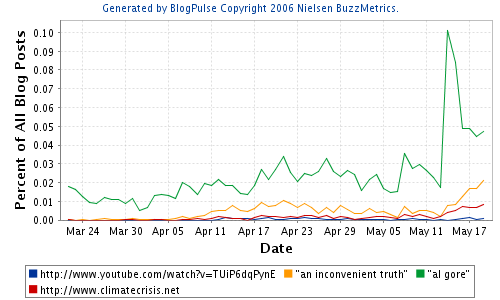 @Blogpulse - what happened? The charts cycled on the sites home page don't appear to be missing this data. Was there a disc/backup failure? Like me, John Battelle was underwhelmed by offerings from Twitter summarizing a year of tweets. Nah. After reviewing them, it's clear that Twitter's first trends release is, well, a bit predictable. But I am sure there is really interesting data locked behind that rather obvious facade....we just can't see it. Yet. Everyone's doing it! YouTube's most watched came out this morning. Again, nothing that eye opening. Wish they'd dig deeper. Proportion of Minorities on Facebook in the U.S. Relative Saturation of Ethnicities on Facebook in the U.S.
Clearly, the intended audiences are different, but hats off (again) to the Facebook data team. Who cares about the pandemic, some guy left his flies open! 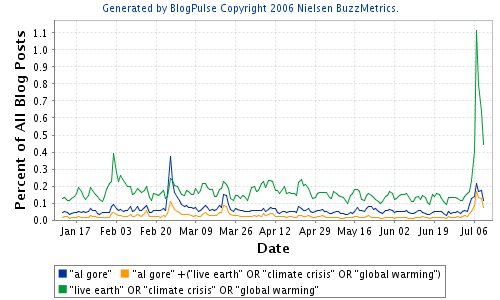 These graphs often have a straightforward story behind them, allowing for a reasonable comparison between mentions of different words. 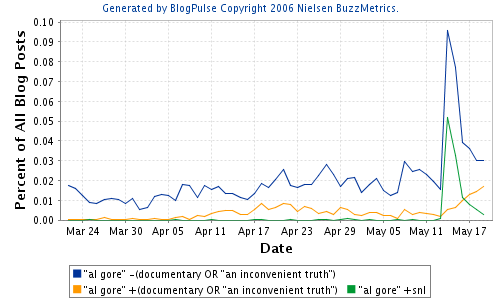 Note, of course, that the graphs show the percentage of blog posts that contain a term, giving a normalized view. There is a reason for this. 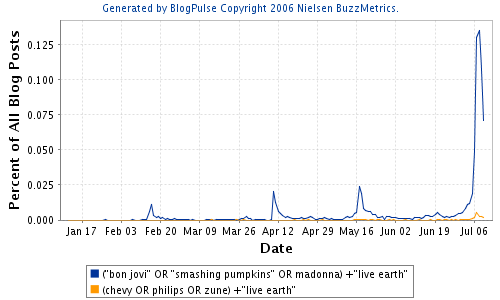 If we look at links to weblogs published on MySpace, we see a matching pattern. 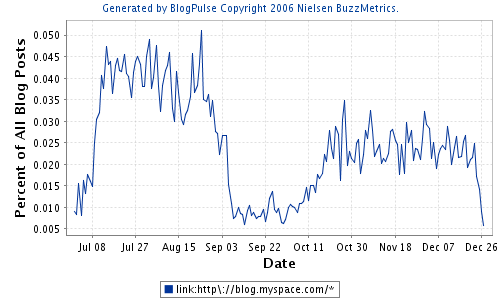 The reason that there are changes in the number of blog posts which link to MySpace blogs is that BlogPulse (Nielsen Online) is adjusting its crawling strategy over time (the above suggests that there was an increase in July, a decrease in September and another increase in October). 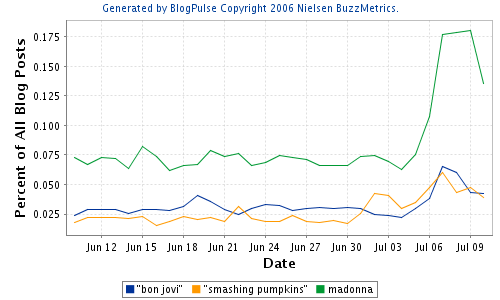 So, while I continue to believe that BlogPulse, and the trending tool in particular, are very useful, one has to be careful (and informed) regarding the base data that these analytics are built on. 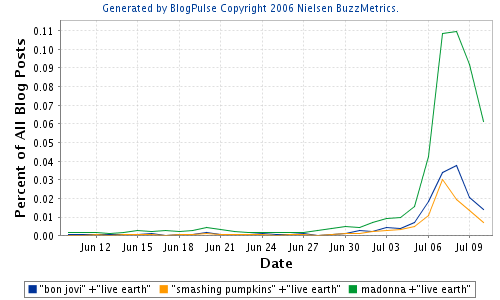 Some trends associated with the recent Live Earth concerts. 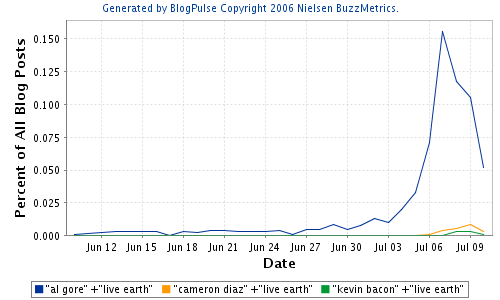 Interesting to note the relative association between Live Earth and the bands, brands and celebrities that helped promote the event. 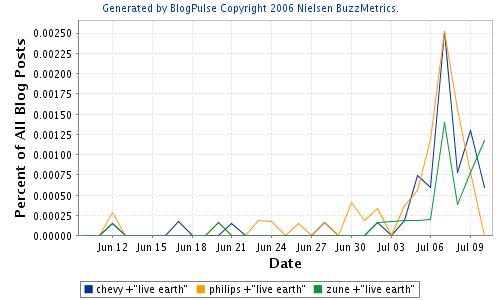 The graph below suggests that Philips, via their promotion of efficient light bulbs, got the biggest jump. Note that the absolute numbers are pretty low, so we can't read too much in to this. 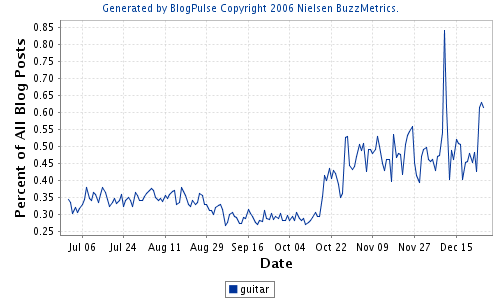 Below we see that bands, obviously, get far more attention than brands. Some exciting news: Natalie Glance, whom I worked with at WhizBang!Labs, Intelliseek and BuzzMetrics, has taken a new position at Google's Pittsburgh location. Natalie was the driving force behind BlogPulse - a portal to the blogosphere. 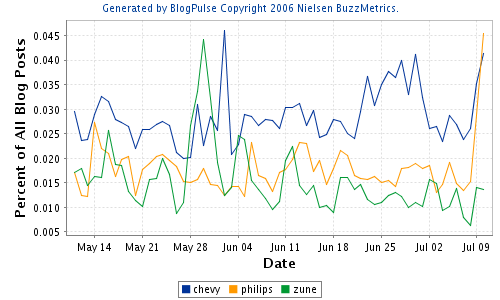 BlogPulse has been responsible for many innovations (some of which have become mainstream features in a number of other sites) and provided some analytical tools which illustrated the power of social media analytics. 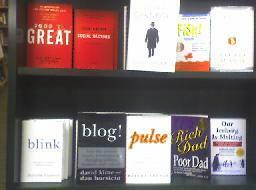 BlogPulse was definitely a labour of love for all those involved. BlogPulse ultimately provided significant value to both our employer and to the blog community in general and it is a testament to Natalie's vision that this skunk works project has continued since its inception over 3 years ago. Google is lucky to have Natalie on board, and I wish her all the best in her new position. One of the basic properties of old world programmed media was the fixed time slot. This was a particularly defining feature of the news. There had to be exactly 30 minutes (or whatever) of news to fill the slot. If that day was slow, the news was padded with light stuff, if that day was hot, then the light stuff was dropped as were other moderately important features. You would think that that approach to media would be one of the first to drop online. We may, perhaps, be forgiving of the online presence of mainstream media - there is a fixed real estate on their front page. 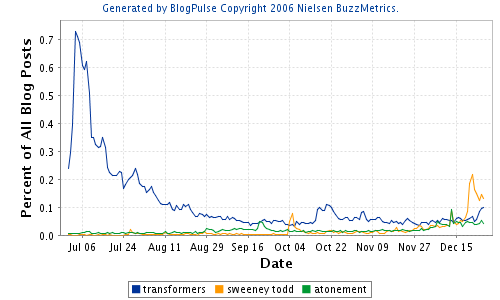 However, having become aware of the issue, I'm less forgiving of Web 2.0 aggregators including: memeorandum/techmeme, TailRank and even our own BlogPulse. Take techmeme for example. 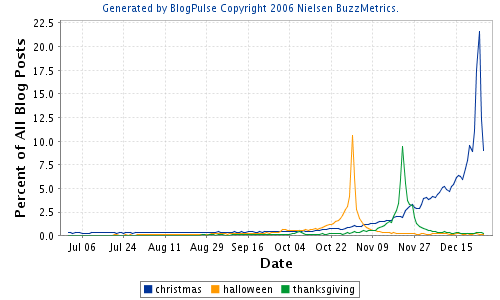 Stories are ranked according, in part (I'm guessing) to how many citations they get from which bloggers. However, on one day, a story with citations from A and B may appear on the front page whereas on another it may not - depending not on how important that story is absolutely, but how important it is relative to all other stories. I say that we should be looking for interfaces to information that reflect how important that information is and which don't persist artifacts of the very media that we are (apparently) trying to escape. 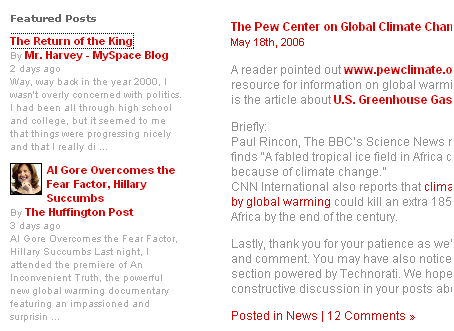 BlogPulse provides some additional perspective. 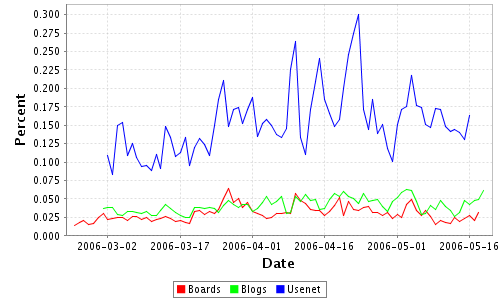 It is interesting to note, however, that in terms of percentage of authors, usenet is the place to be for this issue - not blogs. 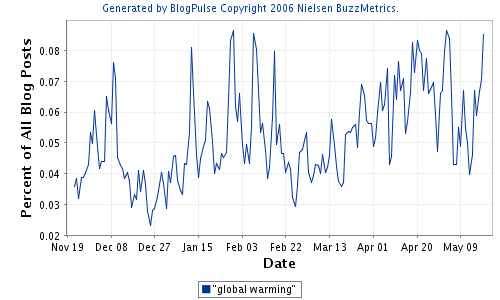 The graph below shows the percentage of posts in blogs, boards and usenet which mention the phrase "global warming". Finally, the PR News Wire service has distributed the press release for the Technorati, Paramount relationship, but I've yet to see it show up on the Technorati site. On the reciprocal end, Technorati is currently serving ads for Lions Gate's Peaceful Warrior - expect to see Paramount advertising in this space in the near future. As I mentioned earlier, Technorati recently revised their home page to give more real estate to adverts - in anticipation of the Paramount deal going live.